The celebrities all turned up in their bedazzling best for the Grammy 2019 red carpet. Cardi B had a spot of trouble walking in a sculpted look that evoked a mermaid in the half shell, pearls included. It was hatched in 1995 by Thierry Mugler. Jennifer Lopez donned a huge white bejeweled hat and Lady Gaga chose a silver strapless sequin gown with a high slit and side ruffle, thanks to Celine. The Lopez topper pointed to a popular accessory of the evening — statement hats. It had a brim for miles and was embellished to match her dress of the same shade. She appeared relaxed in her Ralph & Russo look as she posed for photographers with boyfriend Alex Rodriguez, who wore a multi-coloured dress jacket. Katy Perry, meanwhile, arrived in a pink Balmain confection that prompted comparisons to a cake topper. 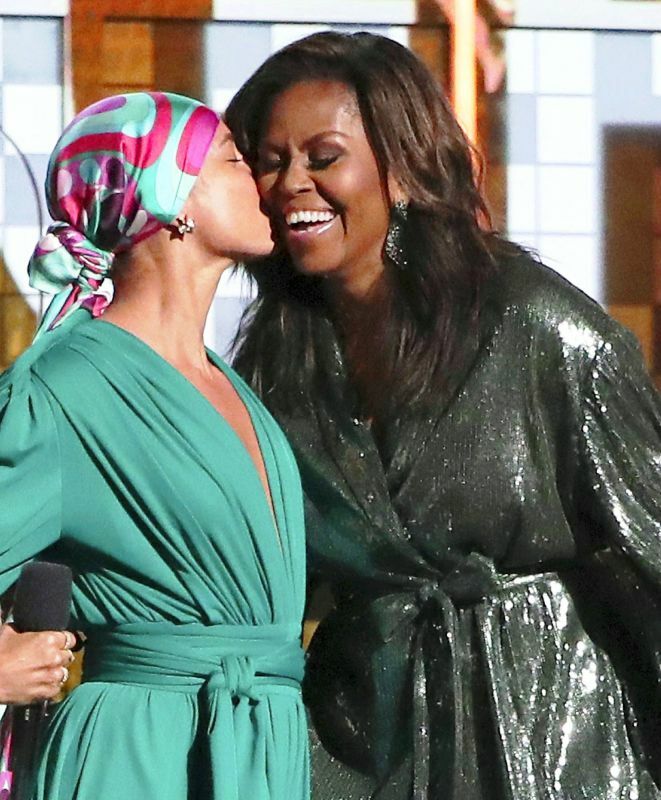 Michelle Obama popped up in a metallic trouser outfit onstage. Her look was customised by Sachin & Babi. Lending a hand opening the show, she earned a rousing welcome from the crowd in Los Angeles. 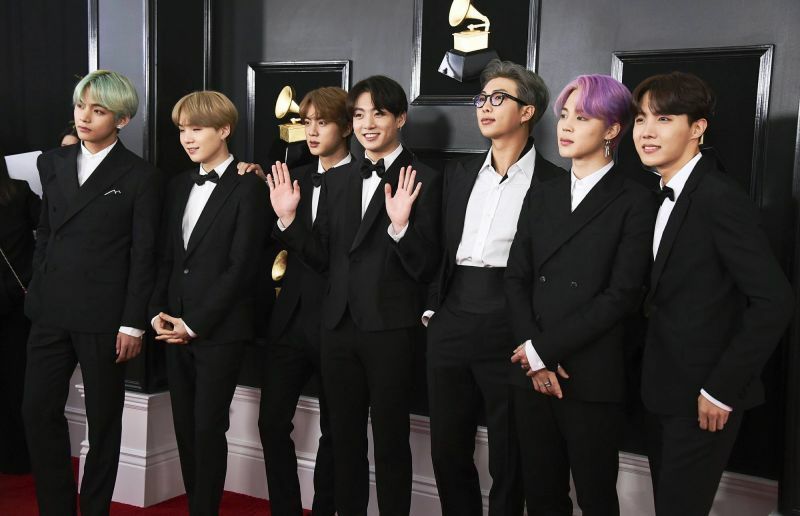 The K-pop sensation BTS showed up in black tuxedos and coloured hair, including purple and green, while Maren Morris sported a huge yellow winged decoration on one shoulder of a floral halter gown with a full loosely pleated skirt and plunging neckline, from Galia Lahav Couture. Dolly Parton wore a short red dress with a ruffle lapel and a chunky jewel centrepiece. Dua Lipa won best necklace of the night, a huge diamond piece in a circular design. As for the guys, some went wild. 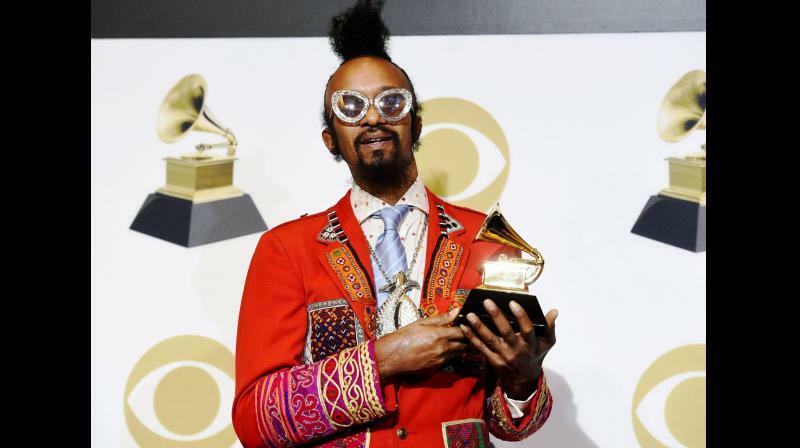 Fantastic Negrito, the Oakland, California-born blues artist, represented in a red suit with large, colourful swatches for pockets. His silver necklace of two fish used to be a belt buckle, said the upcycling enthusiast. 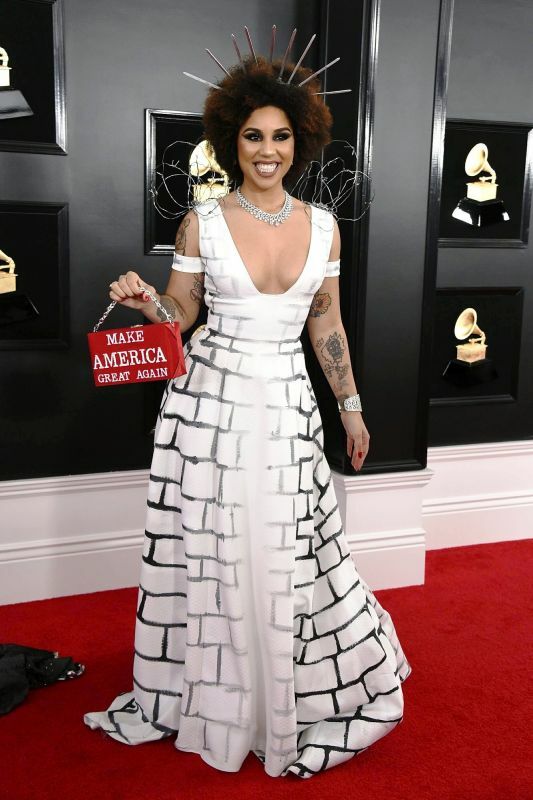 Repeat political provocateur Joy Villa, who attended last year in a gown decorated with a foetus, dressed as President Trump’s wall (think tinfoil) and carried a ‘Make America Great Again’ handbag. She first made a Trump splash two years ago in Trump messaging.